What is IRCTC Tatkal ticket ? Most of you would be aware of Tatkal booking scheme of IRCTC.But I will like to discuss it here in detail.There is still some confusion regarding the IRCTCT Tatkal booking scheme.Most of the trains have some seats under Tatkal scheme.These seats cannot be reserved before a specific time period. You can book Tatkal ticket only after 24 hours ahead of train departure time from 10 AM.For example a train is scheduled to depart from Station A on Tuesday.You can book Tatkal ticket for that train after 10 AM on Monday.You cannot book ticket before that. Time taken to enter details like Passenger information. Captcha sometimes does not load.You need to refresh it.Time is also consumed in entering captcha. Also you do not get any refund for cancelled confirmed Tatkal tickets.So you should be extremely sure before booking any IRCTC Tatkal ticket. This method works in Chrome web browser.So if you have not installed Chrome web browser then install it.You can install it using this link.After installing Chrome browser open it.After opening it click on this link.You will have to install this Chrome Addon (Ticket Master).You can install this addon by clicking on the plus button on right hand top corner (as shown in the below image). On the above screen click on New Ticket option.After clicking on New Ticket a new tab will open in your Chrome Browser.The tab will have heading Ticket Master.There will be three sections in the tab as mentioned below.I will explain each section in detail. The IRCTC login details section displays two options User Name and Password.You need to enter your IRCTC user name and password. Next you will have to enter Passenger details.I have shown the Passenger details section below.It is same as that of IRCTC.So you will not have any issues.Remember if you are booking IRCTC Tatkal ticket then you should enter the ID card no for one of the passenger.After entering all the details click on the submit button.This will save all your changes. This screen shows all the tickets you created and saved using step 2 to step 6.You can create as many ticket list as you want.In a single ticket you can only select one train.So you can create separate tickets for separate trains.All the tickets created will be displayed on this screen.Now we will move towards booking the ticket. Book Now — Click this button to book new ticket using this addon.It automatically open a new tab with IRCTC,logs you in and enters passenger details.You go straight to the payment option selection screen.After this you will have to proceed as you do normally.So the time consuming effort of entering login details,selecting the train,Entering passenger details and entering captcha details are taken care of by the addon. Remove — This button removes the ticket from list of ticket. Edit — In case you want to make changes in the created ticket then this is the option.You can edit ticket details with this button. You should start ticket booking with this addon exactly at 10 AM.If you are using it too early then chances are that IRCTC time is not 10 AM.In that case it would not allow you to book IRCTC Tatkal ticket.So you should execute this script exactly at 10 AM or couple of minutes before it. Above method is fastest way to book IRCTC ticket.This addon also has good amount of positive review.So it seems to be reliable as well.I have not tried it to book a ticket.I had a demo run before writing this post.You can try this at your end and share your experience. it’s a very nice app. people can do another work instead of waiting in the queue to get the reservation tickets. now anyone can do the online tickets. this is the very helpful app. this post is really very helpful for us. I am a just regular traveler. hence it helped me a lot. This is very nice information regarding IRCTC that you shared with us. thanks for sharing this post. Thanks for this amazing piece of knowledge, thanks for sharing this. Thats really amazing dude. Thank you so much for the valuable information on tatkal ticket booking. Here i would love to mention one thing that.. recently irctc has changed some rules and regulations for booking. thank You. Check here to download SHAREit for PC free. Hi Esha,I have a problem regarding IRCTC app.I’m using Iphone 5s and i didn’t found any helpful app for my phone.Can you suggest me any good iOS app ? Thank you for sharing this info here…this helped me a lot..it will help many user to book their tatkal tickets.. Thanks for this amazing guide I m new to Irctc and this guide helped me a lot! 4. 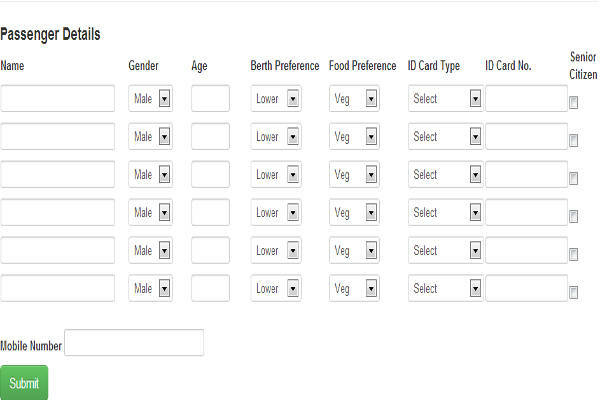 Enable form and fill the details. 5. Save & Open IRCTC page. 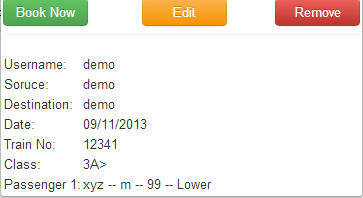 Now you will notice that data will be automatically filled. Have any one irctc software tell me. THANKS, NOW YOU TELL ME HOW TO FILL CAPURE AUTOMETICALLY ? Thanks for sharing these methods of tatkaal booking. Wonderful methods to book confirmed tatkaal ticket with ease. Very informative post. After clicking on Book Now Option on TicketMaster window it goes to IRCTC page without logging so we need to login again & then a fresh window is opening to book a ticket so what does ticket master do new ? how solve the captcha problem ? I think u know about now genaration version, Have u any tips on this irctc lite version ? pls help me. Are you facing this issue repeatedly. Hello Esha Upadhaya my problem is when i use Ticket Master for tatkal ticket booking it does not works friendly because when i reach on the passangers details automaticlly then a massage comes by irctc that please enter the captcha in proper value and then press ok . After press OK button the irctc site is logout. plz suggest me why it is happening and what is its solution. Thanks a lot. What is the solution for captcha problem ? How to fully automate the process ?? And Mr Vivek Gupta Solution, if you have the solution really, please let us know..
To get rid of Captcha problem. 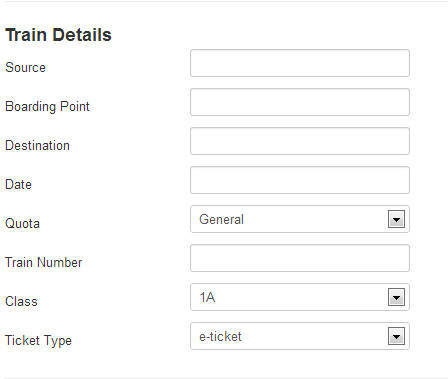 First half of ticket booking i.e login and Plan my travel>>Use Google chrome’s ticket master. After this on it reaches the passenger list page then Click on “Ticket Master tab Again” and this time “Clear Script”. After reading all this, getting ticket is not less than Lottery :). Somebody has to taken care of Captcha problem.. When I tried, no special speed increase was observed and after filling name details when clicked the image space already showing 007 and not going due to that no further movement was done. Ultimately closed irctc site and lost normal attempt also. Therefore who wants to follow please check otherwise will get no ticket. So the problem i have encountered is that during the image captcha option it started autofilling on its own. so atleast someone should remove the option….. It was a gud work….It is redirecting everything….but it is failing in IMAGE CAPATCHA and automatically logout from the page. please fix that image captcha issue and after that it should have some custom time delay for selecting that “booking now” option.Because at 10 AM time,irctc itself will not login because of server load. If you fix all those issues,then this would be great work i have ever seen. Thanks Esha and yes the bug prevents the page from going to payment option after auto verification code page…. Can anyone take the pain in just updating me anytime a new version with the issue resolved comes in? Hello Esha Upadhaya my problem is when i use Ticket Master for tatkal ticket booking it does not works after auto filing cahtcha and not go to bank page. so plz suggest me how it may be possilble that i go to bank payment page. I facing to This problem from 30 days. After captcha page not forward for bank page. plz suggest me and solved the problem. in regard this problem i recevied an reply from your side but i can not understand about solution the problem. 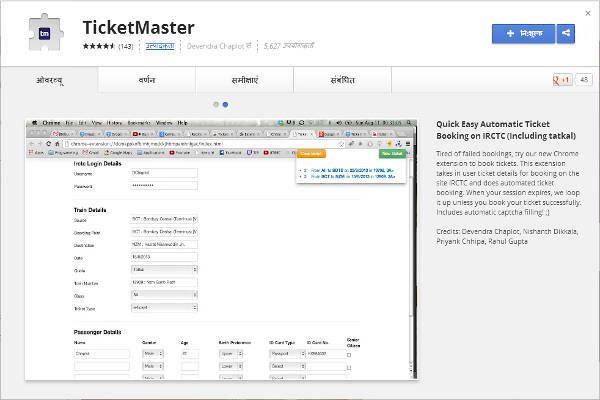 so plz tell me that from where i can get the new version of ticket master so that i use friendly the ticket master. If you are facing problem with this version then you should wait for next version for the bug to be fixed.The developers need to fix it.BTW after captcha what is happening? Could you please tell that..
Hello Esha Upadhaya my problem is when i use Ticket Master for tatkal ticket booking it does not works after auto filing cahtcha and not go to bank page. so plz suggest me how it may be possilble that i go to bank payment page. I facing to This problem from 15 days. After captcha page not forward for bank page. plz suggest me and solved the problem. in regard this problem i recevied an reply from your side but i can not understand about solution the problem. so plz tell me that from where i can get the new version of ticket master so that i use friendly the ticket master. I wanted to confirm have to released new build for it or it is in progress. CHILDREN BELOW 5 YEARS (FOR WHOM TICKET IS NOT TO BE ISSUED). Book my ticket only if atleast one lower berth is allotted. Book my ticket only if atleast two lower berths are allotted. Book my ticket only if all the above passengers are allotted berths in the same coach. Passenger Mobile Number: +91* SMS will be sent to this Mobile Number. Rajan Singh Do you mean that the information inserted in the addon is not getting reflected while booking the ticket. Rajan Singh Could you please provide more details?